Unified basic material provides consistency amongst the different compositional structures. Free declamation in certain parts contrasts with sections with strict formal construction. Sub-titles for the movements are to be understood as fundamental imaginative ideas for the movement in question - a kind of verbal programme, as for example placed by Olivier Messiaen at the beginning of a number of works. In a concert, it is a good idea to read the relevant texts before each movement. But the Lord saw that the wickedness of mankind had become great on the earth. Every inclination of the thoughts of their minds was only evil all the time and they rebelled against his laws. Noah was a godly man; he was blameless among his contemporaries. He walked with God. So God said to Noah, "I have decided that all living creatures must die, for the earth is filled with violence because of them. Now I am about to destroy them and the earth. Make for yourself an ark of cypress wood. Make rooms in the ark, and cover it with pitch inside and out. I am about to bring floodwaters on the earth to destroy from under the sky all the living creatures that have the breath of life in them. And Noah did all that God commanded him. But I will confirm my covenant with you. You will enter the ark-you, your sons, your wife, and your sons' wives with you. You must bring into the ark two of every kind of living creature from all flesh, male and female, to keep them alive with you. The flood engulfed the earth for forty days. As the waters increased, they completely overwhelmed the earth and the ark floated on the surface of the waters. So the Lord destroyed every living thing that was on the surface of the ground. The waters prevailed over the earth for one hundred and fifty days. But God remembered Noah and all the animals that were with him in the ark. God caused a wind to blow over the earth and the waters receded. The rain stopped falling from the sky. Then God spoke to Noah and said, "Come out of the ark with your family and all the animals. Let them be fruitful and multiply on the earth!" Noah built an altar and offered burnt offerings in thanks for his safety. And God said, "This is the guarantee of the covenant I am making with you: I will place my rainbow in the clouds, and it will become a guarantee of the covenant between me and the earth. When the rainbow is in the clouds, I will notice it and remember the perpetual covenant between God and all living creatures that are on the earth." The performers are urged "to play the sections together and avoid any quick changes of registration". the piece is a true concert work and is difficult for both performers. very descriptive writing, especially in the flood movement. Appropriate for concerts. In the "Biblical Scenes", organ and oboe paraphrase texts from the book of Genesis. The five movements evoke for me formal associations such as Toccata, Meditation, Fantasy, Elegy and Contemplation in a late-Romantic sense, very much as in French organ music. At the same time, the oboe continually punctuates the form, creates moments of tranquillity, caesuras, appears in alternation or in combination with the organ. Cantabile or, better, expressive solo figures occur in the oboe part, in which the organ intervenes, there are two-part pedal passages, motif development arises out of recitativo passages, striking cries in the oboe combine with massive mixtures in the organ to create dramatic scenes. Hummel's "Biblical Scenes" are a remarkable example of meditative, text-based church music. With his "Biblical Scenes", Hummel has enriched the repertoire in this area with a very varied and distinctive work. 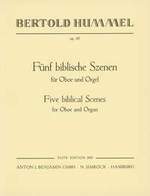 In the refined melodic ideas and the always well-sounding whole, we hear a convincing expression of total musicianship. .
Bertold Hummel's "Five biblical Scenes" for oboe and organ, inspired by texts from the book of Genesis, are concentrated on unified basic material which emphasises the consistency of the several compositional structures and reflect vividly and concisely, with meditation, illustration and in thought-pictures the fundamental concepts of the relevant texts. Hummel remains true to his principles here: clear forms, no unnecessary "chattering" around the theme, a lively sense for refined effects in sonority and compact expression..